I started out with a D3100 a few years ago when I started using DSLR’s. It was a great starter camera, but lacked a few things I really wanted. For starters, I love love love that the D90 has an internal focusing motor built in. 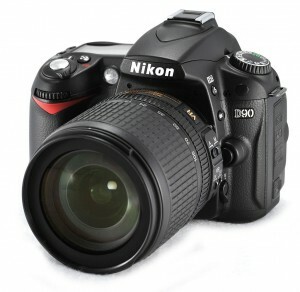 This is a “pro” feature, and I believe the D90 is the lowest end Nikon camera that has the feature. The reason I like it so much is that I buy a lot of older, used lenses, which of course don’t have a built in motor, this solves that problem and saves me quite a bit of money. Some people don’t care about the motor, as they always buy the newer Nikon lenses. With a newborn just added to our family, my photography budget is pretty small. After the jump find out the reasons I love the camera, even if it is old by technology standards. Besides the aforementioned internal motor, the D90 has great usability. The LCD screen on the top combined with 2 dials makes changing/checking settings a breeze. I don’t have to navigate menus to change the ISO settings, image format etc. You are probably thinking that it’s not a big deal, and I thought the same thing before I got it. But now that I’ve had it for a year, I couldn’t go back to navigating through menu after menu. The last thing I like is having advanced flash control. Commander mode allows you to control up to two groups of flashes, as well as tweak some of the settings right in camera. I don’t use TTL very often but I do like having Auto FP/HSS, which is high speed sync. This essentially allows your max flash shutter sync speed to exceed what the camera is rated for. The D90 is 1/200, but with Auto FP activated, it can go up to 1/4000. You have to have a compatible flash though. Any of the Nikon SB600 through SB900 can be used with Auto FP/HSS, there are also a few off brands that can do it. Shot of my niece, it’s mid afternoon. Take a look at the image to the right, of my niece Maia. We were going for a Game of Thrones/Nights Watch look. I shot it at 1/2000, f4.5 and ISO 200. 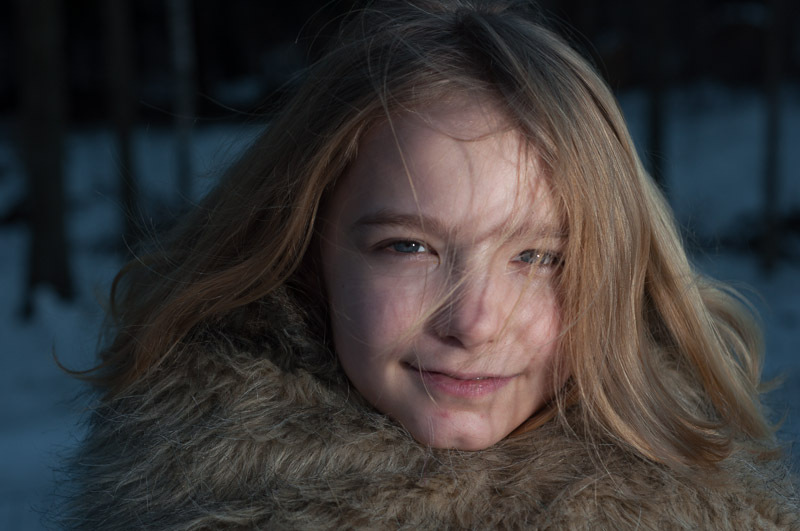 My sister held the SB700 camera right, fairly close to Maia, as the flash power is drastically reduced when using HSS. The faster the shutter speed, the more power the flash loses. On to the negatives of the D90. On the down side, it’s an older camera, coming out in 2008. It uses the first generation EXPEED image processor, current generation Nikons are on the EXPEED 3. In the DxO tests, EXPEED 2 and 3 are clearly superior in image quality, although I’m not sure in the real world what the comparison is. One thing I do know is that the ISO noise reduction is definitely better in the later processors. The D90 also has only 12.3 MP, which in this day and age I suppose isn’t too impressive. Mega pixels are mostly a marketing ploy by the manufacturers, the only time I would like more resolution is if I was going to do a tiny crop and could use the extra quality. As you can see, I’m a huge fan of this camera. At this point, I’ll probably keep it for a while longer. When I do upgrade, it will most likely end up being for the D7000, which has come down in price quite a bit lately and is a true upgrade to the D90. I want to buy this camera if the trim feature has a way of cropping photos in camera.Could you answer this question for me. Thanks so much for the information.I have purchased one and really love it.It is the perfect camera for me and the results are incredible. Glad you like it. I still have mine and although I’ve thought about upgrading it, I still probably won’t for a while. Short of going full frame, I’d probably upgrade to the D7100. I have two of the Nikon D90’s and yes you can trim or crop as I say in camera plus you can do lots of other things in camera to your pictures.This camera is all I will ever need as the picture quality is outstanding and I have shot literally thousands and thousands of photos with my two Nikon D90’s.Buy one and you won/t be disappointed. I’ll tell you waht has a rubbish camera – the samsung U600. YOu need a hand as steady as a rock to take teh pic, and then wait about 10 seconds for the thing to focus and snppC.omalete rubbish!The iPhone camera is great in comparison! Hi Richard! The trim mode on the D90 will crop the image in camera, although it’s somewhat limited. You can adjust the aspect ratio, and you can crop the photo by choosing 3 or 4 pre set sizes, but it isn’t anywhere near as robust as cropping it in Lightroom or Photoshop.